Starting from scratch is not easy. That is why we share such translator resources to help colleagues save time. We take the effort out of the process so you can leverage notes, worksheets, templates, scripts and more. Kindly share this page to help other linguists benefit, too. "Hello, Carlos Djomo. Thanks very much for this initiative." This course teaches you practical and powerful techniques to seamlessly assess, translate and recreate PDF documents. It is a 5-day email course where you’ll learn how to identity types of PDFs for better processing, preliminary measures to ensure a smooth translation process as well as creative ways to mirror the layout of any PDF file. How if you could tap into what makes a translator’s CV irresistible to clients? Dying of passing the 10-second test and standing out of the crowd? This 5-day email course is what you need. It explores the anatomy of a translator’s CV, provides tips from expert and vendor managers and includes worksheets, case studies, and data-backed tips to win the CV battle. There is a misconception that translation and branding are mutually exclusive. This is plain wrong! Join this free community and receive resources to build a strong translator brand, plus tips and tricks to boost online visibility, so your profile would stand out of the millions ones available on the Internet. 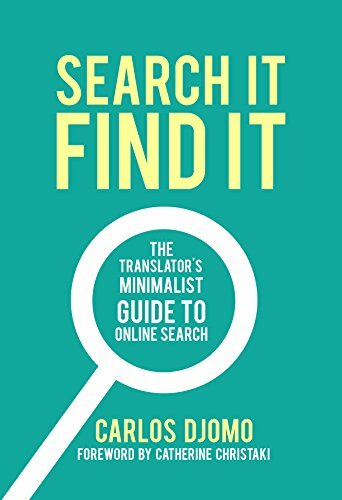 Discover the book which teaches simple yet effective ways to search and find virtually ANYTHING online. The Internet is an ocean, this will be your compass!